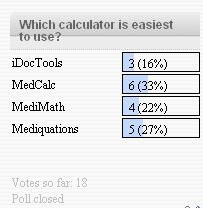 Our nonscientific iPhone Medical Calculator Useability poll is complete. The Results - Figure 1. To address these limitations, a follow up study will be conducted. Stay tuned! Wow, your poll sure would not have survived journal club at my med school! The big question is: have people really tried all these different calculators? Or, are they simply rating their own experience using one calculator?